Father of the Bride Part II is so precious and gross it should be awful . . . but it’s just so charming and nice. I would say that it’s actually better than the first. It actually has a little drama with the whole double pregnancy story line. I do hate how bright these movies are, they’re filmed like an episode of a Paula Deen show. I don’t want everything to be super bright and orange and hazy. This movie kind of reminds me of Judd Apatow movies because it’s just about wealthy people enjoying their wealth. I can’t really say if I like Apatow or the Father of the Bride movies more. Okay, whatever. I don’t know what Chris is going to write about this movie, but if it’s mean, he’s WRONG. How can you say anything bad about this movie? It’s perfect in its pleasantness, in its simplicity, in its good naturedness. Like the first movie, Father of the Bride Part II is a movie that exists in an idyllic world, where people are nice and everything is clean and problems come up occasionally but it all works out in the end because LIFE IS NICE AND ISN’T IT NICE TO WATCH A MOVIE ABOUT THAT? I was wondering if I had grown up watching something like Larry Crowne, a movie that I think is so boring and bad because of its lack of conflict, if I would think of it the way I do the Father of the Bride movies. And I guess it’s possible, but what the Father of the Bride movies have over movies like Larry Crowne is that they’re genuinely funny. Now, is it the most complex of comedy? No. But it’s nice! And it’s cute and it’s funny. 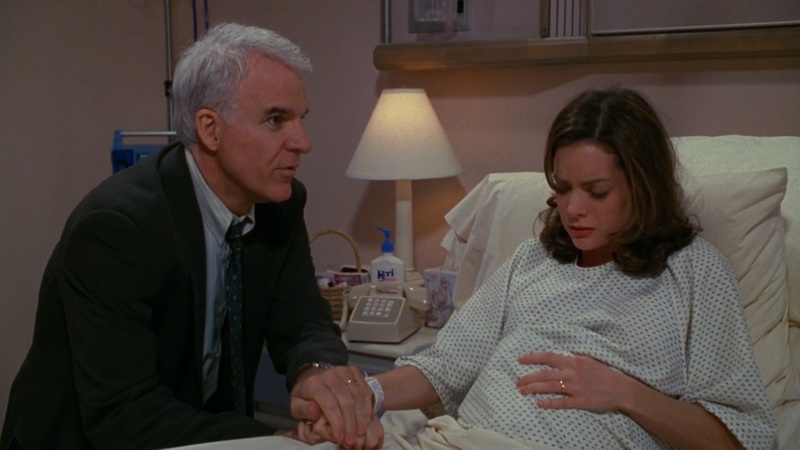 One of my favorite parts is when George (Steve Martin) and Nina (Diane Keaton) are driving home from the doctor’s office after just finding out that Nina is pregnant. When Nina, who is excited about the baby, looks how her window, she seems comedically perfect scenarios of children, like a beautiful young mother skipping down the sidewalk with her equally beautiful little daughter. However, when George, who is not excited about the baby, looks out his window, he sees (what I consider) reality: things like a little kid throwing a tantrum because he wants a hot dog before throwing food in his father’s face and running off. It’s a simple scene, but also, in my mind, just sort of perfect. JUST LIKE BOTH OF THE FATHER OF THE BRIDE MOVIES! !